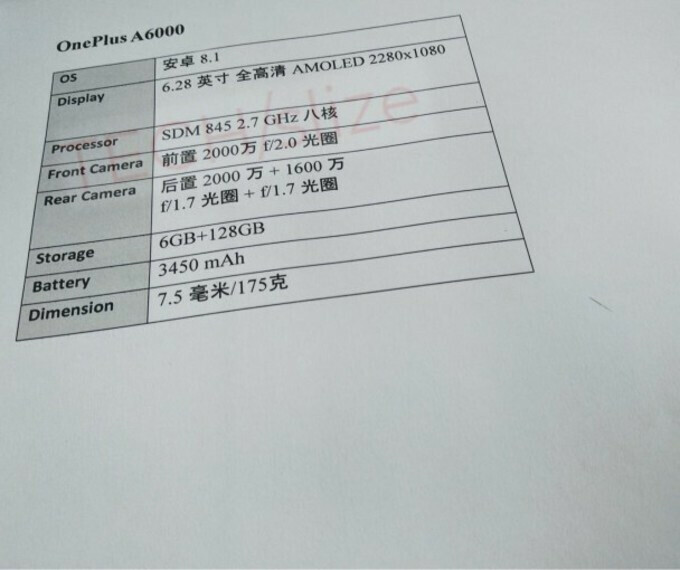 A new leak originating from mainland China claims to be revealing all the essential specs of the upcoming OnePlus 6 A6000, the design of which could have already debuted to the world under the guide of the Oppo R15 handset that got announced a couple of days ago. According to the crude specs sheet, which could have very well been based on most of the circulating rumors, the phone will have a 2.7GHz Snapdragon 845 chipset paired with 6GB of RAM and 128GB of native storage, as well as a 6.28-inch AMOLED display with a resolution of 1080 by 2280 pixels up front. 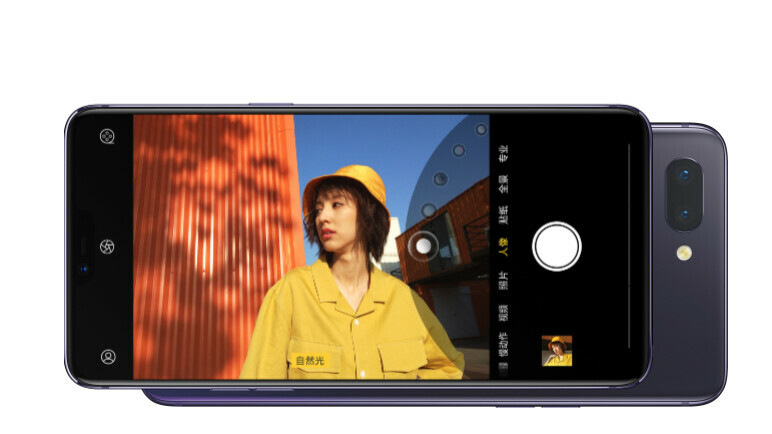 Above it, likely housed in a notch, will be a 20MP selfie snapper with an f/2.0 aperture. At the back, a dual-camera setup consisting of a 20MP f/1.7 and a 16MP f/1.7 snappers will be making the rounds. A 3,450mAh battery will be juicing up the whole setup. The whole device will be 7.5mm thin and will tip the scales at 175gr. While we've been expecting a similar slew of hardware features for the device, we should mention that this particular leak does not strike us as extremely trustworthy. Sure, it seems to corroborate with just about any other hardware leak pertaining the device, but we'll definitely take it with a grain of salt, and so should you. For the full scope, check out our OnePlus 6 rumor roundup. They are gonna go for One Plus 6 with a back finger print scanner and then the Oneplus 6T with under display fingerprint scanner. Still 1080p. I guess they settled on that. I think it's funny how OnePlus and Apple are able to sell lower PPI phones as Flagships and no one really questions it. There's a couple comments but no one tries to say they only sell mid-rangers. But if Samsung or LG did this everyone would freak out. Double standards! OnePlus fan base is as blind as iSheeps. oneplus is literally half of apple.....what are u talking about? Yes kind of a double standard but also have to think that2280x1080 is pretty much 2k screen and to keep cost down I'd sacrifice a 4k screen then any other internals in the device still cheaper then Galaxy and iPhone also. Don't think it's a double standard since they go for flagship specs but not flagship cost. But a UHD screen would be amazing. no, 1080p is half of 2K screen. 8gb ram version will come with 256gb storage. It seems another phone with a notch appears on the horizon. At leat will have a 3.5mm headphone jack. iPhone X has a 19.5:9 display. But OnePlus One looked great. Please someone tell to release a phone with the same OPO design albeit with minimal bezels and with premium materials. Copying of iPhone design from past 4 years by Asian companies has made this otherwise good looking design very generic. I currently own s8 but still I love OPO's design. It was unique even though it was just a rebranded Oppo. I miss that sandstone back. But how is the camera going to be like? 1+1 never shined it that department. Given price tag will be just about the same as other flagship it has to deliver here. The OPO was 5 generations ago and it was their first phone released. I think it's time to let that go. Four generations ago, but who's counting? Damn phones are getting bigger and bigger. An iPhone X copy that runs Android. What a nightmare!